As we reached the Kyle of Loch Alsh, we came across a humongous bridge – the Skye bridge connects the mainland of Loch Alsh to the Isles of Skye. While I was on the bridge, there was a stretch, where I could not see any road but just the sky; it felt like we were airborne!. Manicured gardens greeted us as we entered the Isles of Skye, however, they soon give way to a rugged terrain surrounded by enormous mountains and the sea. There seems to be no distinction between the edge of the waters and the sky; it was absolutely gorgeous. We got to our hotel, a cozy Cottage nestled in the mountains. The temperature outside had started to drop and the rain was picking up. 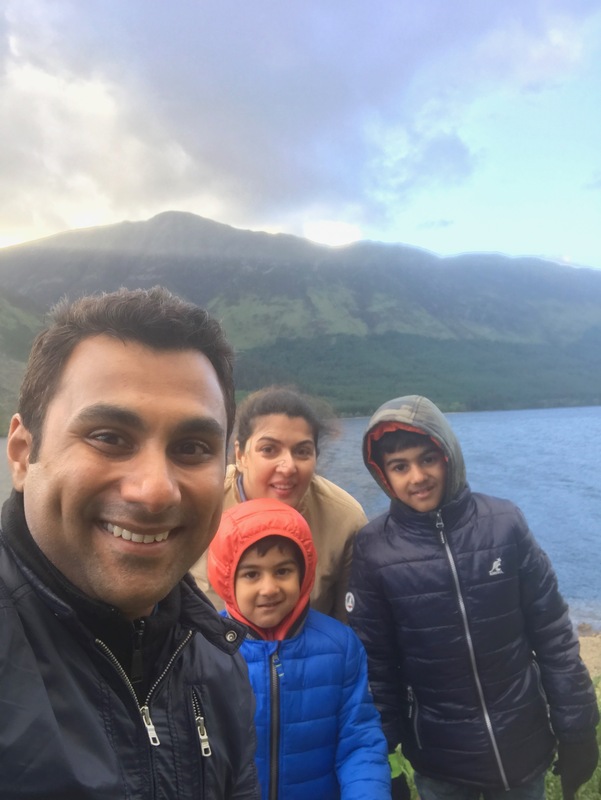 After checking in, we drove down to Skye through the beautiful town of Portree, saw the Storr and the Cuilins and stopped at Kilt Rock, a beautiful waterfall in to the sea and a viewing point with breathtaking views of Skye, right outside Staffin. 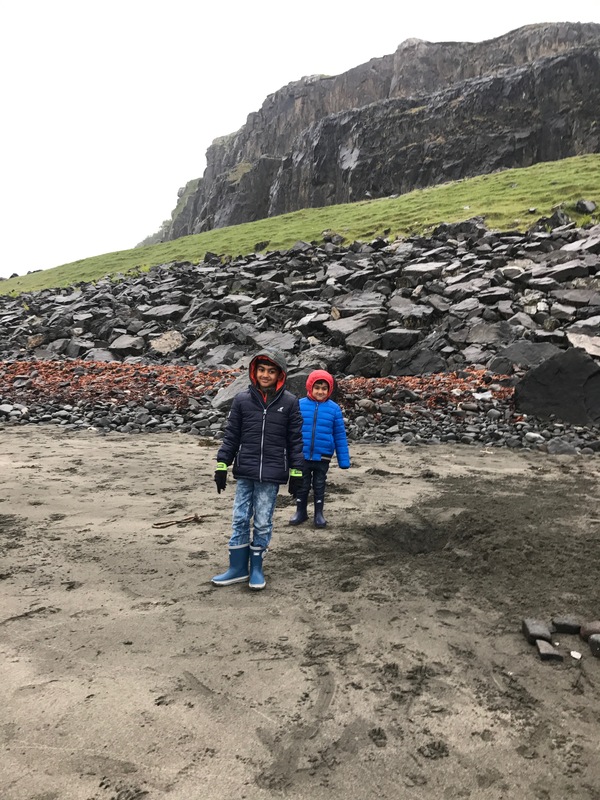 We then made our way to the beach at Staffin to see Dino footprints. There are prehistoric Dino footprints there that are visible when the tide is low. Recently, the island was in the news as another 50 dinosaur tracks were discovered near Brother’s Point. 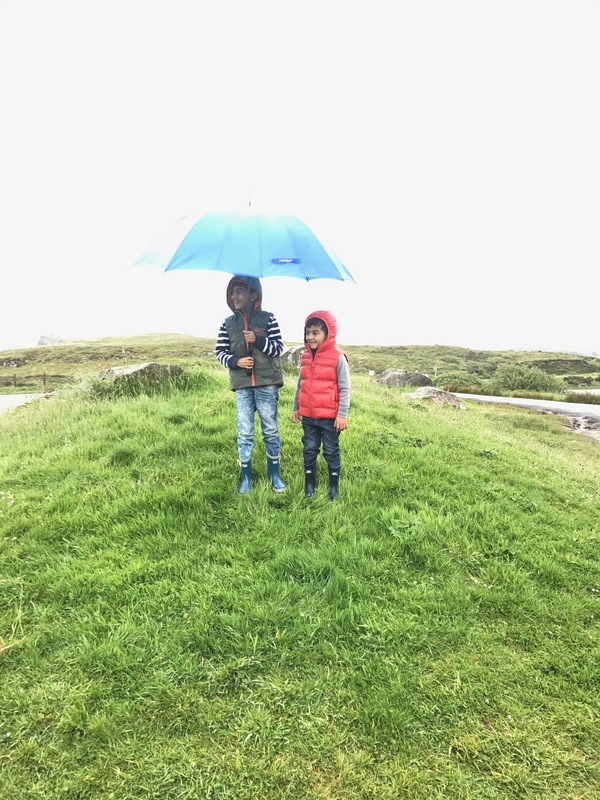 It had started to rain heavy but we were determined, we got to the beach in our gear and commenced out hunt for the prints. After our fossil hunting session was over and we had documented the findings, we made our way to Portree for dinner. 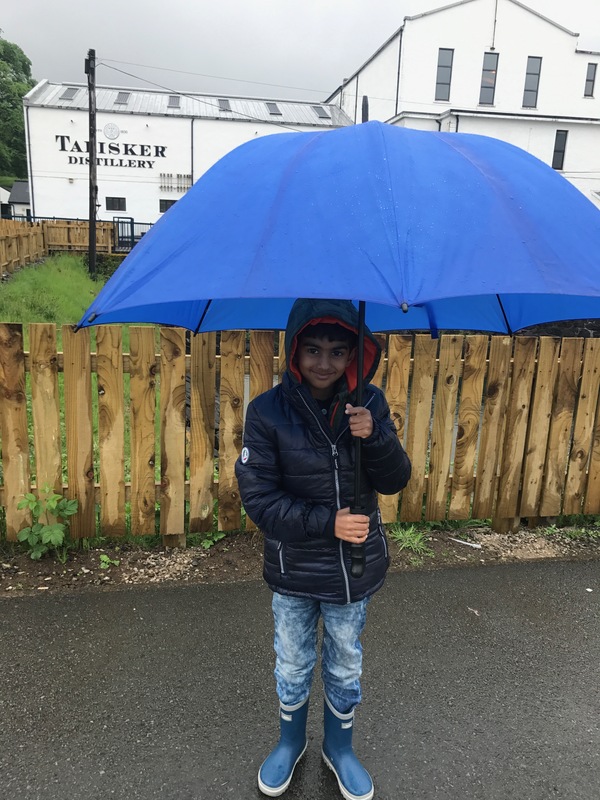 Rains had hit the island, making it a perfect day to visit the Talisker distillery. Since, I was the only one visiting the distillery, I quickly rounded it up and we went to a cozy waterfront restaurant near the distillery. The weather had cleared by the time we were done with lunch, however, venturing for any hikes was still off the tables. On a clear day, visits to the fairy pools and Ness Point lighthouse are recommended. We went to the Kyle and took a ferry tour with the Sea probe Atlantis. Enroute, we stopped at a native candle shop called Isle of Skye candle company on Ford Road . If you love hand made candles and are fond of aroma oils, this place is as good as it gets. They have glass bottomed ferries tours to the underwater Kelp Forests, view otters, seals and a worldwar 2 shipwreck. It was a big sized vessel with very clear glass bottoms to view the underwater forests and it also gets you really close to the seals and the otters. Not to mention, the views from the deck are breathtaking and the birdwatching opportunities on offer. After lunch, we began our journey to Glasgow. 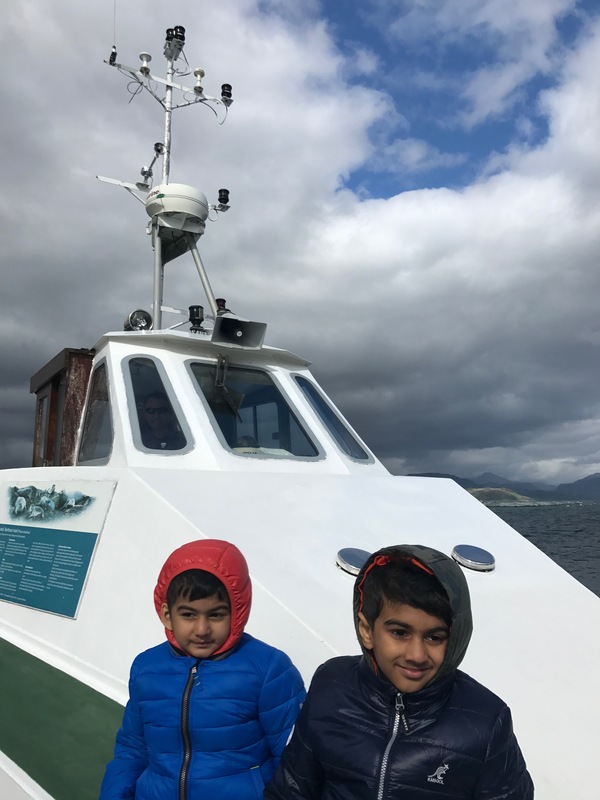 You can exit Skye by using a ferry to Mallaig as well and it is really beautiful, but we wanted to drive through the scenic Glencoe valley again. Ahead of Loch Alsh we found a nice picnic spot. We had bought a disposable barbecue from one of Co-op markets on the way and some food to grill. We took help of nearby campers to fire up our barbecue and it was alive, we were all set. The picnic bag was out and it was chow time. This was the highest point of our trip, we absolutely loved the time together and it will always be one of our most cherished memories. The wife and the older child went walking in the icy cold stream below, I have no clue how they did it but it looked like they were absolutely loving it. The younger one and I were quick to decide that we were happy watching them go in icy waters. Soon we hit the road and in about an hour we were passing through the mesmerizing Glencoe valley. After Glencoe, we drove by the shores of Loch Lomond to Glasgow. As we approached the city, our reverie that we had lived over the past two weeks wthe dichotomy of being welcomed by concrete instead of surreal natural beauty, was almost disheartening. Had a flight back today. We were all packed and ready. We retuned the car to the rental car park across our hotel and walked about 5 minutes to get to the terminal. So this was it; while our vacation came to an end, our smiles did not. We had loads and loads of wonderful memories of this trip, memories that we would reminisce and cherish all our lives.